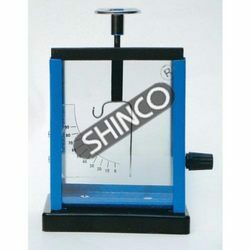 Our range of products include steel magnet rectangular bar, whimshurt machine, magnet field demonstrator, fahnstock clip connector, flask type electroscope and metal case electroscope. 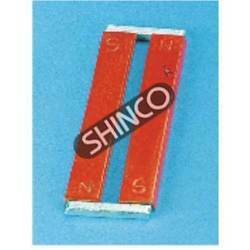 We bring forth for our clients, an extensive array of Steel Magnet Rectangular Bar. Developed with the help of our professionals, these products are useful for student demonstrations, plotting magnetic fields and more. Manufactured using magnetic steel strips, our offered range is supplied in pairs with cardboard separator and plated soft iron keepers. 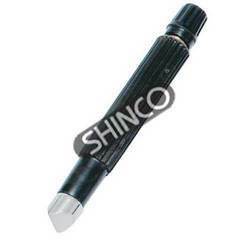 For generating static electric charges and causing electric discharges. Relative to Van de Graaf it produces higher current with lower voltage. 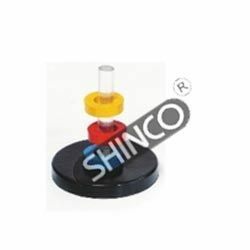 Consists of two high resistance plastic disks of diameter 25mm approx, with equally spaced metal sectors. The discs are supported in two rigid upright supports, rotating in opposite directions with a hand crank. Provided with a system of induced charge collecting brushes, adjustable ball-ended electrodes and cylindrical Leyden jar capacitors for obtaining higher potential. 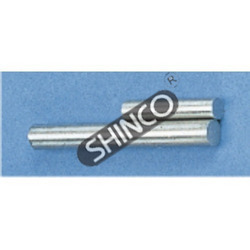 Produces substantial opposite charges which are deposited in the capacitors and on metal spheres. A rapid sequence of sparks can be generated by lowering the system’s capacitance. Mounted on insulated wooden base. To clearly see the magnetic field lines in 1,2 or 3 dimensions. Size 150x75mm. Supplied without the magnet. For making temporary one wire electrical connections in low voltage electrical circuits. Made of brass. With a hole for mounting. For experiments in detection of electric charge and determination of polarity. 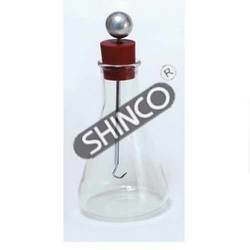 Consists of an Erlenmeyer flask 250mL, and a plated rod with a knob of diameter 16mm (2/3in) passing through a rubber stopper. A pair of aluminium leaves are suspended from the rod. More sensitive instrument as leaf derection is unaffected by air currents or by charges residing on the case. Reacts only to charges which are intentionally brought near or put on them. Comprised of a box made of aluminium with two transparent glass windows to shut out air currents and a plated metal support rod entering from the top through a polyethylene insulator. Two leaves of thin aluminium foil are suspended from the support rod. 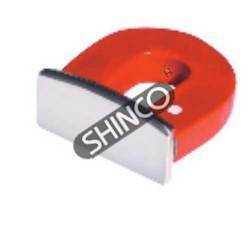 Supplied with three pairs of aluminium leaves. Improved version of simple meter bridge. 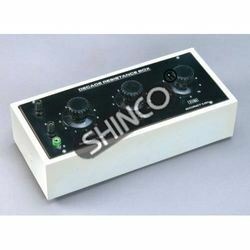 For precise measurement of an unknown electrical resistance and for comparing nearly equal resistances without determination of the end- resistances. 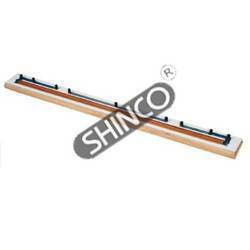 Comprised of a hardwood base 1.1 meter long with laminated top and plastic feet. A meter long constantan resistance wire, 24swg, is stretched along a meter scale graduated in millimeters on this base. 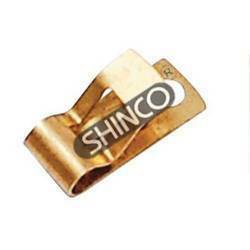 Each end of the wire is normally and precisely attached to plated copper strips. Three more copper strips are XED parallel to the wire providing four gaps. Electric connections are made through 4mm socket binding post terminals. Supplied with a knife - edge jockey to make contact with resistance wire and the galvanometer (not supplied). For wheat stone bridges and potentiometers. A brass metal knife edge is mounted on one end of an insulated handle with a 4mm socket binding post terminal on the other end. 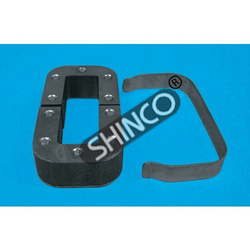 Overall length 100mm. Pack of 10 pieces. 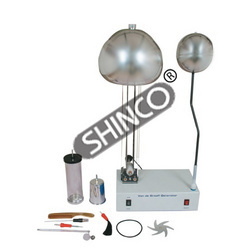 Consists of a large 220mm conductor sphere and a 100mm discharging sphere. The conductor sphere is equipped with a 4 mm socket (for connection to the accessories). The motor operates at a speed up to 5000 r.p.m. and its speed can be varied. Perspex pillar with suspended metallised sphere. Perspex cylinder with metal cap and with metallised spheres. Head of hair with comb. Suitable for laboratory use. Approximate outside height about 28mm and outside width about 26mm painted red with keeper. For having high magnetic field. Grounded on all sides. To show that like magnetic poles repel each other by placing three or more ring magnets on a non-magnetic stand. Comprises three colored ring magnets (o.d. x i.d. x h), 32 x 18 x 6mm magnetized parallel to the axis, equipped with an acrylic rod mounted on a plastic base. The magnets float in the air, one over the others and spring back up when pushed down. Four decade dial type, with tapping points between each dial to allow use as an accurate potential divider, ratio arm, etc. For A.C.or D.C. measurements, accuracy better than 0.1% except 0.1 Ω which is + 0.5%, continuous loading 0.5W each step. 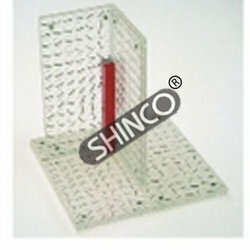 In metal case 273 x 108 x 102mm, with earth connection for high voltage or A.C use and 4mm socket terminals appropriately positioned in circuit diagram on top panel. 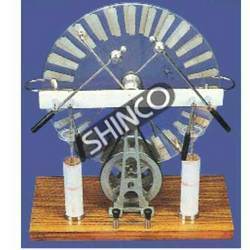 Being a client-centric organization, we are engaged in offering an unmatched range of Hoffman Electrolysis Apparatusto the clients. Ideal for study of the electrolytic decomposition of hoffman electrolysis apparatus such as water & hydrochloric acid, our range is highly acclaimed by our valuable customers. Consists of two vertical 50 mL, gas-collecting, graduated glass tubes with stopcocks at top, this range is joined by a bridging tube to a reservoir and fitted with a pair of platinum electrodes at the lower ends of the glass tubes.